Arden Holiday Cottage in Irongray, near Dumfries, Dumfries & Galloway sleeps 5 people. Arden Holiday Cottage near Dumfries is a delightful home from home set in the beautiful rolling countryside of Dumfries and Galloway. The cottage has everything you need to relax and unwind in the peaceful surroundings. Equipped to a good standard, it is cosy and inviting with open plan living/dining/kitchen areas which overlook the garden and the fields beyond. There is even a telescope available in the cottage. This lovely cottage and its surroundings will certainly relax you and you may never want to leave this peace and tranquillity. However you will be glad if you do decide to discover what delights lie in store for you in this beautiful area. 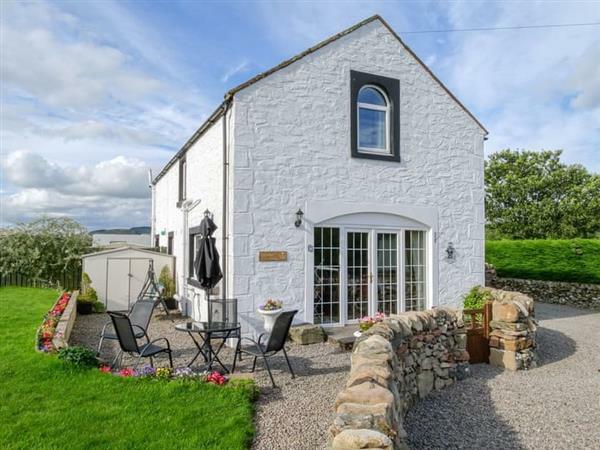 Ideally placed to enjoy the stunning coastline which is only a short drive away, where you can choose between sandy beaches at Southerness or quiet coastal villages like Kippford and Rockcliffe, which are perfect for a stroll by the sea. Steeped in history, the surrounding area has many fabulous castles, none grander than Drumlanrig Castle, a must for a day out. With sailing, swimming, riding, fishing, golf, boat trips and water sports close by, there is something for everyone. The cottage is perfect for bird watchers as starling murmurations can often be seen over the fields around the property. Red Kites also hunt in the skies above and there are many fantastic sites to view all different types of birds, from Red Kites to Svalbard Barnacle Geese, in the local area. Visit the Caerlaverock Wetland Centre, as seen on the BBC’s ’Spring Watch’, or pay a visit to the Red Kite Feeding Station. For walking enthusiasts, Dumfries and Galloway offer an enormous range of walks and hikes, from easy 3km jaunts to longer, more strenuous hikes of 12km or more. The Southern Upland Way and the Annandale Way also pass through the beautiful countryside, and walkers can hike these stages. Leaflets for some of the routes are available at the cottage. Warmed by the Gulf Stream, there are many beautiful gardens to visit, including National Trust’s Threave Garden, which is close to the Galloway Forest Park, and also home to the first Dark Sky Park in Europe. It is also central to five of the 7Stanes at Kirroughtree Forest and Dalbeattie Forest, and is an extremely popular location for cyclists and mountain bikers, and there is a bike wash available in the property. There is a shop 10 miles from Arden Holiday Cottage near Dumfries, with the pub and restaurant 7 miles from Arden Holiday Cottage. Bedroom 2: With 2 twin beds. Oil central heating, electricity, bed linen, towels and Wi-Fi included. Travel cot and highchair available on request. Welcome pack. Enclosed lawned garden with patio and garden furniture. Bike Store. Private parking for 3 cars. No smoking. Holidays at Arden Holiday Cottage run from Friday to Friday. Pets allowed at Arden Holiday Cottage. For a better idea of where Arden Holiday Cottage is, you can see Arden Holiday Cottage on the map below. Arden Holiday Cottage is in Dumfriesshire; should you be on the lookout for a special offer, you can find all the special offers in Dumfriesshire. It's always worth checking to see what is on offer at the moment. Do you want to holiday near Arden Holiday Cottage (UK11141), you can see other cottages within 25 miles of Arden Holiday Cottage; have a look to find your perfect holiday location.